One of the biggest struggles of student life (or recent graduate life, or just life, tbh) can be living on a tight budget. You want to up your outfit game with all the latest trends you see on Instagram, but your budget will only stretch as far as beans on toast. This typically happens when you're having a "I hate all of my clothes and have nothing to wear" phase, which is obviously when you want to shop the most. Luckily, I've found a few handy tips for staying stylish on a budget. The temptation to splurge can be real, especially this time of year when all the beautiful coats come into the shops and you ~need~ all of the boots you see. But if you're on a budget, slow down and go smaller. There are some exceptions to the rule, but generally accessories cost a hell of a lot less than bigger items like coats, and luckily, accessories can be pretty powerful, too. Something as simple as a pair of earrings or a belt can literally overhaul your outfit, and all for a couple of quid. Lately, I've been loving Pat Butcher style earrings, they can seriously sass up any outfit. Love The Sales is a recent find for me, but it's already changing how I shop online. It takes seconds to sign up, and when you do, you select which brands you like, your dress size, shoe size and bra size. Then, when you're browsing, the site shows you the sale picks first, before the option of anything full price, meaning you find the bargains first. There's some really good brands on there too, like Miu Miu, Sister Jane and even high street faves like Missguided. My wardrobe is seriously low on dresses, so I spent a good half hour browsing Love The Sales for dresses and picked out my faves, which all happen to be in the sales! Which is your favourite? Customising your clothes is one of the oldest tricks in the book when it comes to updating your wardrobe on a budget. You can customise your clothes no matter how good your sewing skills, whether it's turning a pair of jeans into shorts, turning a dress into a top or even transforming an old pair of heels. 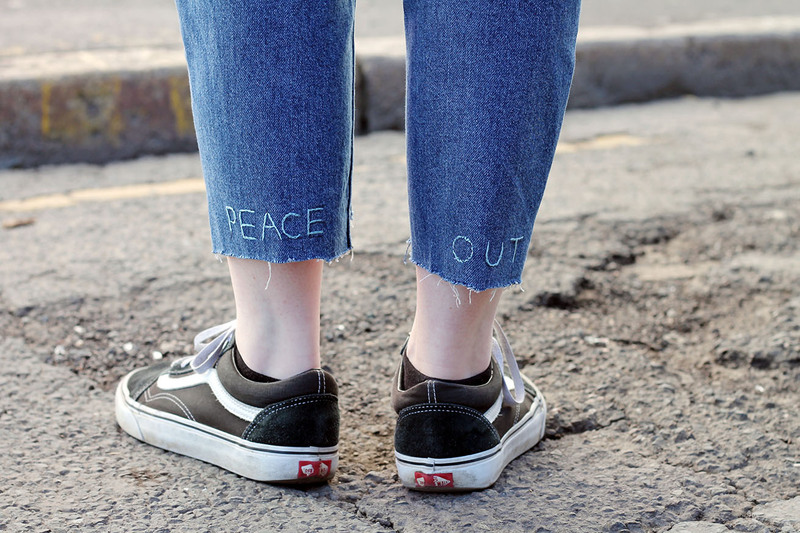 One of my favourite customisations I've done recently has to be spicing up this old pair of jeans with patches, embroidery and a step hem. Check out the DIY denim tutorial on my channel for more ideas. Remember blog sales? Those days seem to be long gone. Now, it's all about Depop. You can literally take the clothes right out of your favourite blogger's wardrobe, and for less than the original selling price. At first I was hesitant about Depop, staying loyal to eBay, but honestly, the Depop app is just so much easier, and works a bit like Instagram. I still have a few pieces left on my Depop page so make sure to take a look if there's anything that takes your fancy. And don't forget about trust charity shops too! One of my favourite skirts I found in my local Oxfam for just a fiver. You never know what you might find.. So hopefully those 4 ways to stay stylish on a budget helped you in your quest to up your outfit game whilst still having enough money for coffee. Let me know which money saving tip was your favourite and if you have any others make sure to pop them in the comments below! Great post. And I love this Love Sales site, so handy for hunting out a bargain!